With our Certified Organic, Non-GMO Sprout Packs you can have highly nutritious food on your table in 3 days, anytime of year, anywhere in the city or country. 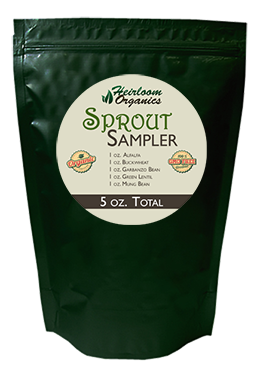 Our Sprout Sampler Pack contains 5 Varieties of nutritious, fast-growing sprouts. Includes a FREE Sprout Bag with Purchase before July 15. Organic Alfalfa Sprouting Seeds - One of the most popular, nutritious & delicious of all sprouting seeds. Alfalfa sprouts are very tasty, with a sweet, nut-like flavor. Alfalfa sprouts are what people typically think of when you mention sprouts. They are the ones you commonly see at a salad bar. Rich in phytochemicals, they protect against cancer, heart disease, osteoporosis and fibrocystic breast disease. They stimulate natural killer cell activity, which strengthens the immune system. What's more, they are beneficial in reducing symptoms of PMS and menopause, including hot flashes. Furthermore, they contain high concentrations of antioxidants, the body's defense against the destruction of DNA which is the cause of aging. Alfalfa sprouts are abundant sources of vitamins A, B, C, E and K, the minerals calcium, iron, magnesium, phosphorus, potassium and zinc. Also carotene, chlorophyll, amino acids and trace elements. They contain 35% protein. Typical foods set aside for storage are traditionally low or nonexistent in vitamin C and many of the B vitamins. With Organic Buck Wheat seeds however this is not that case, from those same storage foods can be sprouted to give a rich source of these important nutrients. Organic Buck Wheat Seed Sprouts are an excellent source of vitamin C and also contain many good B vitamins. And you probably won't find a less expensive way to get these vitamins than from low calorie organic buck wheat seed sprouts. Garbanzo Sprouts have a nutty flavor suitable for marinating or as additions to salads or loaves. They will be ready to harvest and eat in 3 to 5 days. Delicious choice for Sprouting. Filling, Healthy and Delicious. Garbanzo beans are high in fiber and also a great source of protein. These Non-GMO Garbanzo beans are tested for chemicals, pathogens and germination before sent to you. Organic Lentil sprouts are high in fiber, protein and amino acids, vitamins A, C, B complex and E, iron, calcium and phosphorous. Raw organic green lentil sprouts can have a mild peppery flavor. Organic green lentil sprout seeds make a good substitute for celery or green pepper in salads, soups and vegetable combinations. Green lentils are great in lentil soups, Indian recipes or anywhere you would use lentils. Lentil soup is hearty and nutritious and was a staple food of the middle east in biblical times. Organic Mung Bean Sprouting Seeds - One of the most popular, nutritious & delicious of all sprouting seeds. Mung Bean sprouts are very tasty, with a hearty, meaty flavor. Mung Bean sprouts are what people typically think of when you mention Chinese food. The sprouts you grow from these seeds are incredibly rich in PROTEIN. Calcium and phosphorous are also abundant in mung bean sprouts. The vitamin content is very similar to asparagus and certain mushrooms, being very high in vitamin A.